Schwalbe announced the introduction of these two tires earlier this summer (we outlined the details HERE) and we’ve finally managed to get a set onto a test bike for some investigations. 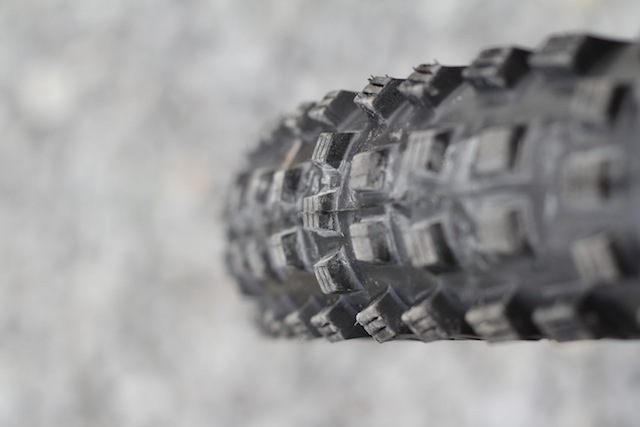 The two newest tires are the Magic Mary and the Rock Razor, the former being a chunky, intermediate tire and the latter being a fast-rolling semi-slick best suited to use as a rear tire. I received both tires in 27.5-inch size, in Schwalbe’s tubeless ready Evo casing (effectively single-ply but with some Schwalbe carcass thread wrapping magic). They were fitted to a set of SRAM Rail 50 wheels (review to come). I set them up using Stan’s tubeless solution and plugged them onto a 2014 Kona Process 134, and then I spent the weekend skidding around some of the burliest trails in Whistler. This is not a complete review, just an account of my first impressions. The Magic Mary. Get ready for digging the trail out of your socks. The Magic Mary, the successor to the popular Muddy Mary, has an intermediate profile with chunky shoulder knobs for increased braking traction and cornering grip, even in soft, muddy terrain. 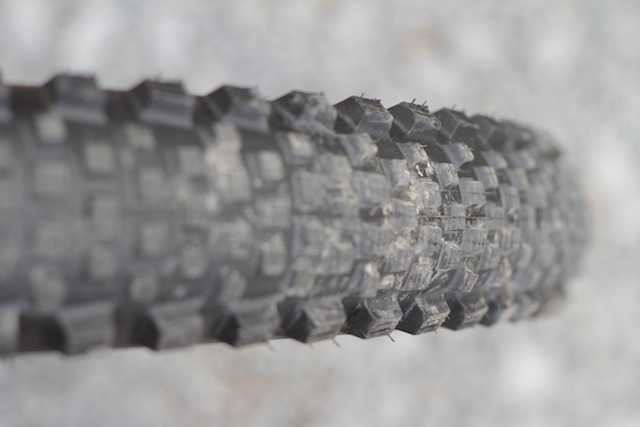 Schwalbe describes this as a very versatile tire; I would describe it as an uber-aggresive, destroyer of loam trails. The knobs are huge, blocky and have lots of smart looking sipes in the knobs. It’s obvious that this tire is exactly what you need if you are riding in loose or wet conditions. They look somewhat like cut-spikes. They aren’t meant for fast rolling, hardpack, big-ring trails; rolling resistance is definitely noticeable and the acceleration isn’t as fast as what you’d experience on less aggressive tires, but the ramped centre knobs do help keep your wheels rolling along better than expected. Braking and cornering is exceptional. The first ride I took these tires on was a hairball, steeper-than-steep, rock roll and loam factory ride. The late summer conditions were absolutely perfect for such a trail, but I was thankful for the incredible control that the Magic Mary afforded. Negotiating some of the steeps required creeping into the entrances and then letting everything roll before sticking a do-or-die turn at the bottom. The Magic Mary gave all the required grip on the rock slab or root entrances and then would hold any turn I gave it. I spent more than just a few moments yelping like a coyote in heat as loam, thrown up by the front tire, poured into my socks. The Rock Razor. Smooth, fast rolling tire that still has elevated cornering sensibilities. Schwalbe say that “The semi-slick Rock Razor tire, when fitted to the rear wheel, helps riders eat up any dry and fast route.” So I fitted it to the rear and stood back, excited for the speed I might be able to achieve now. The tire tread is very low in the centre. A four-three line-up of low profile square knobs means that the tire looks fast, but on the shoulder are big, burly cornering knobs for confidence inspiring turning. The tire is quite fat, even for a 2.35. Fitted to the 23-millimeter wide SRAM Rail 50 wheels meant the tire had a pleasing profile that was a little squarer than otherwise, exaggerating the corner knobs a bit more. On the trail, the rolling resistance is noticeable. It zipped along then the corner knobs would kick in for cornering duties. The reduced braking on steeps is also apparent and after a few close calls I was sure to go into things with a little more caution than usual. This is not a tire for getting out of control and then looking for a helping hand. Know its limitations and its strengths and you’ll stay happy. One thing I may experiment with is cutting the centre knobs to open up the pattern for improved braking on looser, stepper terrain. I did slice the sidewall and the tread carcass (two separate incidents) on the first ride. The former from impact on the rim (resulting in a dented rim) and the latter from a rock slice through a centre knob about five millimeters long that the sealant couldn’t heal. I would confess that the terrain I took these tires into was perhaps more rugged than they are intended for. I’m a prime candidate for Schwalbe’s Super Gravity tires. After the second cut it was onto tubes again which, surprisingly, improved the tire somewhat. I had been struggling to find the right tire pressure that balanced traction and carcass stability. Even when pumped up hard the tire flexed and wriggled more than I enjoyed. Once I had a tube inside, the tire felt a lot more certain. Again, I’d be interested to try this tire in a beefier Super Gravity setup. Fresh tires sealed and ready to roll. One of life’s simple pleasures. The Magic Mary appears to be a great tire for anyone that really likes hanging it all out in technical conditions, thanks to a powerful tread that holds a line, performs well under braking and can cope with getting buried deep in turns. The only downside is that your might choke on the loam being sprayed from the front tire, but that’s not a bad thing. Tasty earth. 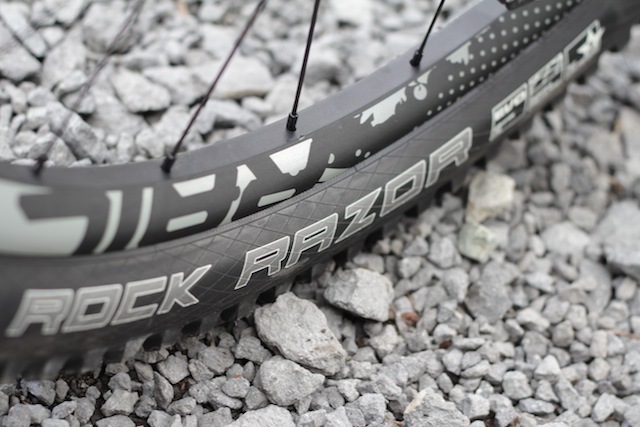 The Rock Razor could be a great mid-summer tire or a candidate for any place that is dry, hardpacked and fast. I won’t immediately discredit the pattern, I’ll spend more time testing them in other parts of British Columbia before offering a final verdict on the tread, but I am sad that it only took one ride to lose the tire’s tubeless capabilities. Admittedly, I might have pushed the tire beyond its intended purposes and sidewall/carcass cuts are not unknown occurrences when you’re running a single-ply tire, but I expected more than a single ride out of them. As a pair, the two new Schwalbe tires compliment one other very well. The Magic Mary up front does the majority of the braking and control while the Rock Razor has a carving bite and still allows the rear end to be moved, drifted and thrown about. Using the Magic Marys on the front and rear would be overkill in all but the most extreme of conditions. The same holds true for the Rock Razor (though on the other end of the trail condition spectrum). Paired together, however, the tires are a potent combo.